BoJack Horseman’s ringtone is still the theme song to Horsin’ Around. In the thirty-ish years since, he’s drank and slept his way around Hollywood, stolen the Hollywood D, had a book written, and swung from beloved to notorious to some mixture of the two. He got cast in Secretariat. That’s about it—oh no wait, he also slept with his former co-star who played his daughter. Anyway, it’s safe to say that BoJack’s had some trouble moving on from his former life, the one with an endless supply of validation. So even now as he’s trying to handle a serious girlfriend and a serious role in a serious movie, BoJack can’t quite let go of the past. Those multi-cam sets were paper thin, but they were home. 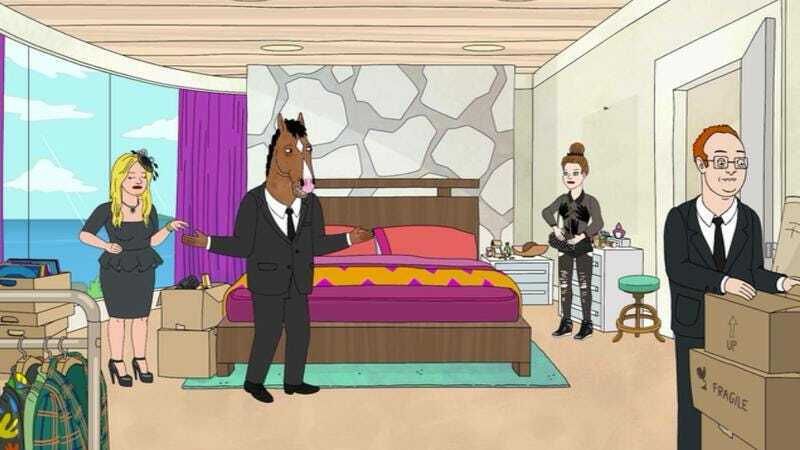 The Horsin’ Around cast was paid to be there, but they were still more of a family than BoJack ever had. “Still Broken” dives into these familiar themes with the funeral for Herb Kazazz (Stanley Tucci), the creator of Horsin’ Around and BoJack’s former best friend. We get a reminder of how disastrous BoJack’s final confrontation with Herb was from Charlotte (Olivia Wilde), Herb’s ex and BoJack’s One Who Got Away. People from BoJack’s past reading the book and learning some hard—but not necessarily surprising—truths about him looks to be a recurring theme. Wilde is lowkey as this older Charlotte, who escapes Herb’s funeral to smoke a cigarette and tells BoJack with a snort that she only ended up in that idyllic Maine fantasy of his for a month before moving outside of Santa Fe. 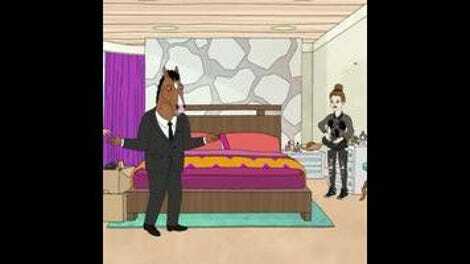 She leaves quickly, but there’s no way that’s the last BoJack will see of her. BoJack then gets to grapple with the kids from his show, who are now grown up and varying degrees of insufferable. We’ve already gotten to know Sarah Lynn (Kristen Schaal), the classic child star who got messed up from terrible adults making terrible calls in her life and who currently messes herself up with whatever drugs are within grabbing distance. Then there’s Bradley Hitler-Smith (Adam Conover), the requisite awkward redhead kid who grew up into an awkward redhead adult with his own hardware store, the biggest in all of Seattle Olympia. Finally there’s Joelle (repeat performer Alison Brie), who once played the Valley Girl older sister on Horsin’ Around and now plays a semi-British theatre actress in her everyday life. The cut from the cast’s first pilot shooting to their present at Herb’s funeral is jarring, and deeply miserable. There’s no way any of them are going to recapture the feeling they had when Horsin’ Around was picking up steam, but they sure as hell try when Herb’s blind bat attorney gives them a floppy disk that will supposedly lead them to his gold. The assumption here is that wacky hijinks will ensue, which is certainly what BoJack wants, since this treasure hunt has the potential to be the “reunion episode” they never had. (The studio thought it was “too edgy.”) It’s disappointing, then, when the search ends up limply hopping between just a few locations. Despite the fact that Will Arnett, Schaal, and Brie have bounced off each other before, the coming together of these characters doesn’t spark quite as much as the premise promises. Also, they almost immediately solve the mystery, and the reveal that they’ve been looking for Herb’s manuscript all this time is underwhelming. But when the plot fails, BoJack’s outsized characters pick up the slack. Kristen Schaal’s Sarah Lynn is still the most fun monster, with her narcissism and random yowls. Brie, who can in fact pull off a decent British accent, does great work straddling the line with Joelle’s Madonna-esque speaking voice. Stanley Tucci better show up in more flashbacks, because his alternately snarly and fatherly Herb is a masterful turn that is a perfect foil for Will Arnett’s BoJack. And of course, a final shoutout must go to onetime Law and Order: SVU guest star Henry Winkler, whose streak of self-aware absurdist sendups continues with his BoJack alter ego, who steals Herb’s awful manuscript as an act of mercy. The non-BoJack subplots are paper thin this episode, between Todd believing that a Urkel’s old cloning machine has granted him magical confidence powers and Princess Carolyn faking her way through Herb’s funeral to gain favor with his powerful friends. At the very least, Todd’s time as ne’er do well badass “Toad” lets Aaron Paul loose in a much different direction than usual. Paul leans into Toad’s growling so hard that by the time he stumbles his way back into Todd, it’s genuinely startling. But between these thin storylines and the perfectly fine reunion, this is the first time since the premiere when I remembered that the season was made with its full season release in mind. It’s a transitional episode that will likely make more sense in the grand scheme of things than as an individual chapter. I’m not supposed to love Sarah Lynn’s trashy funeral outfit, right? Still pretty sad about that shark who swam up to a human surfer all hopeful for friendship. Love Mr. Peanutbutter goading Princess Carolyn into more and more lies because he genuinely wants to hear them. But uh, where’s Diane? “The air in 1830’s California was fragrant with the flowers of laughter, and the smoke of adventure.” Herb’s book really was terrible, but I would’ve read every last word of it.